Authorities are ramping up their efforts to identify fentanyl flooding the U.S. from China, control the ingredients used to make the deadly synthetic opioid, and prosecute and eliminate the manufacturers. The U.S. State Department and the Drug Enforcement Agency are working with Chinese and Mexican authorities to bolster technology and training to facilitate real-time supply chain data sharing, improve detection of illicit opioids sent via mail, eliminate clandestine labs that produce the products, regulate the precursor drugs used to make the addictive painkillers, and better trace digital transactions. The topic was the focus of the House of Representatives Committee on Foreign Affairs Thursday, which explored how to limit synthetic fentanyl production in China, which is the primary source of illicit synthetic drugs like fentanyl that are sent to the U.S. directly or through Mexico, authorities said. Detecting small traces of fentanyl in the mail is a challenge because it is easy to hide and can go through so many routes, said Kirsten Madison, assistant secretary of state for international narcotics and law enforcement affairs. "It is not an old-school interdiction approach," Madison said at the hearing, adding that the dark web has also democratized access. "It is a very different business model, which presents a new horizon and challenge." In 2015, China outlawed some of the substances used to make synthetic opioids, but it is still much easier to develop overseas than in the U.S., said Paul Knierim, deputy chief of operations at the office of global enforcement for the DEA. The DEA plans to open an office in Guangzhou, China, and possibly Shanghai, to further limit synthetic opioid production, he said. "Clandestine chemists can easily continue developing and synthesizing new synthetic opioids that do not appear on any schedule of controlled substances," Knierim said at the hearing. Chairman of the committee, Rep. Chris Smith (R-N.J.), recommended using the Global Magnitsky Act, which targets corrupt officials and human rights abusers, to ensure that corrupt Chinese officials and narcotics traffickers are held accountable. Smith also brought up Garrett Holman during the hearing, one of around 30,000 Americans who die from fentanyl overdoses a year. Holman began to self-medicate for his anxiety and depression, purchasing synthetic opioids online from China. He passed away from a fentanyl overdose in December 2016, eight days before his 31st birthday. Opioid abuse and overdose has had a devastating impact on communities throughout the country. It has also overburdened healthcare providers, the law enforcement system and social service organizations. Between 2012 and 2016, the number of overdose deaths involving synthetic opioids increased by nearly 640%, and provisional 2017 data from the Center for Disease Control and Prevention suggest that this trend is continuing upwards. The Justice Department and U.S. Drug Enforcement Administration proposed reducing manufacturing quotas for the six most frequently abused opioids, including fentanyl, by an average of 10% in 2019. Although, providers worry that the opioid manufacturing caps are cutting off the supply for cancer patients and others with chronic pain who need the powerful painkillers. Pharmacists and physicians argue that the vast majority of the fentanyl that's killing people in droves isn't being diverted from hospitals, which makes these quota reductions misguided. The House of Representatives recently passed an array of opioid bills that seek to intercept illicit opioids delivered in the mail, stem fentanyl use, expand access to treatment and recovery services, and develop opioid alternatives for pain treatment, among other aims. 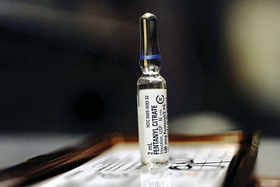 The Synthetics and Overdose Prevention Act, for instance, would require the U.S. Postal Service — as private carriers like UPS and Fed-Ex are mandated — to obtain information on the shipper and addressee to better prepare customers and border control agents. The collection of 58 bills awaits a Senate vote. Members of the House Committee of Foreign Affairs addressed the need for treating rather than incarcerating substance abusers. But treatment and rehabilitation services have been unable to keep up with the epidemic. While there is much progress to be made, there are some positive signs, Smith said. Law enforcement at Ocean County, N.J., for example, recently implemented a program that allows drug addicts to voluntarily turn themselves in without being prosecuted. About 800 people turned themselves in since 2017 and got treatment. "We need to go after those who are hawking and selling the drugs, but victims also need to be treated for what it is — a disease," Smith said.